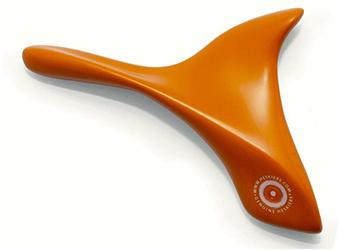 The Heskiers OneTool is an innovative body tool designed with your every ache and pain in mind. It is an ergonomically designed myofascial release tool which offers you the ability to aid in your own bodywork treatment from the comfort of your own home. The Heskiers Method adopted by professional practitioners combines excellently with your bodywork techniques. The OneTool is a tool of choice for self-treatment by athletes and health-conscious people who want some control over their own pain and muscular discomfort. The Heskiers OneTool can also help to prevent any further injuries and can speed up your recovery process. It couldn’t be easier! All you need to do is locate the pain, grasp your OneTool and begin to apply a combination of light massages and strokes in the area in order to open the muscles to allow release. The innovative Heskiers OneTool has been expertly designed to naturally replicate parts of your very own hand and to work in unison with all parts of your body. It can help to give more precision and power to a practitioner treatment or to your own self-treatment to potentially relieve pain and tension and minimize stress. The Heskiers OneTool is the perfect tool for your hands by minimizing the pressure needed to give effective deep tissue treatments and may protect you from work related injuries to your hands, arms and shoulders. The Heskiers Method is compatible with any other bodywork technique or method and can be enjoyed by health professionals and those who just want to aid in their own recovery. All you need is OneTool. Medical-grade, friction-free nylon used for prostheses and meets all requirements for CE marking of Medical Equipment Class 1. Rinse your Heskiers OneTool with alcohol and dishwasher soap. Heskiers OneTool can be autoclaved though we recommend only to use this method in cases whereas it is imperative to use it. Do not put into dishwasher machine.